A few months back Sandy mentioned he fancied catching a common skate. The biggest fish he's caught before was a fine 28 pound salmon. Over few conversations a plan was hatched to have an attempt at smashing this, pulling a few back muscles and working up a sweat! 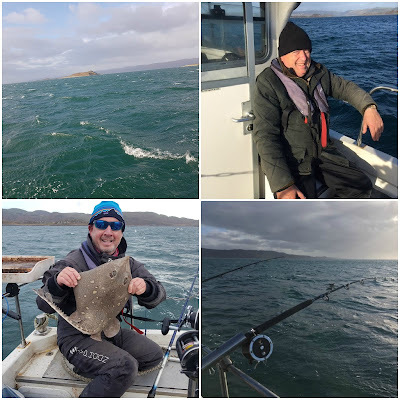 I had warned him it wasn't for everyone, possibly me included these day, but we pushed on regardless with the idea and booked a trip with the guys at Seadog Charters out of Ardfern. With four big baits out and about three hours gone and nothing doing, we opted to drop a single rod with a smaller bait down to see what was around. It had hardly touched the bottom when it was taken. This produced a Thornback for me. Sandy was up next, think he had a dogfish and then a Thornback, then it was just dogfish from there on in. I was kind of hoping that a few Spurdogs might have made an appearance to break things up a bit. The guys mentioned they were in the deeper water in numbers. I can imagine with 1-4 pounds of lead on and with the constant re-baiting, it might be a chore with the big rods at times. It got to the last knockings when Sandy lifted into something on the small rod. Now anyone who's done this type of fishing will know how Skate have an uncanny knack of landing on the smallest baits and lightest rods. To be fair, I thought this was exactly what had happened and I was thinking, here we go for two hours! Sadly it turned out to be the mother of all tangles. With 4 huge baits and 8 pounds of lead we could have been forgiven for thinking we were in. Given how rough it was I secretly think Sandy was actually relieved. So unfortunately, no Skate on this trip but we've agreed to have another crack at it in the spring. The pain will stay deferred for another day!